The holiday season is right around the corner. For the past few years I have struggled to find the holiday spirit, but this year I seem to have it in an abundance. The feeling brings a comfort and ease, allowing the stresses of everyday life to fade into the background. Perhaps it is the excitement of having a new home to fill with lights and cheer, but I am grateful to have holiday baking and decorating ranking high on my priority list. As with most holiday family gatherings, bringing the dessert falls on my shoulders (and I am only happy to oblige). While classic pies—pumpkin, apple, and chocolate cream—are a Thanksgiving tradition, I also enjoy introducing a new dessert alongside the standard selection. In past years, the flavor combinations of chocolate and ginger and pumpkin and espresso have made appearances. For this Thanksgiving, I am planning for the flavors of pumpkin and caramel to join together with rum and raisin in this bread pudding recipe. I first made a batch of pumpkin bread pudding seven years ago while I was living in Montreal for graduate school. A large group of us gathered in the living room of a small, one-bedroom apartment, far-flung from our families and homes, to celebrate Thanksgiving together. The meal may have been cobbled together (and each other's faces new and unfamiliar), but we enjoyed each other's company and left with full stomachs. The recipe I used back then was quite fussy. While it was delicious, it had too many steps and special techniques to make it approachable for a busy holiday season. For this version of pumpkin caramel bread pudding, I took the same ideas—pumpkin, caramel, and rum raisins—but simplified the recipe to a few steps without losing any of the classic flavors. This Pumpkin Caramel Bread Pudding is a decadent, seasonal dish to share. Brioche bread cubes are layered with rum-soaked raisins, and set into a rich, pumpkin based custard. Caramel sauce is drizzled over the top just before serving. The preparation of this bread pudding allows for some flexibility—prepare it the night before and bake the next morning, or bake it the evening before and reheat before serving. Whether for brunch or dessert, the bread pudding will be a crowd pleaser. In a small saucepan, place the rum and raisins over medium-low heat. Remove from the heat when warm. Cover and let the raisins soak for 20 minutes. Set aside. In a blender, blend together the half and half, whole milk, pumpkin, eggs, maple syrup, spices, vanilla, and salt until uniform. Set aside. In a 9 x 13-inch baking dish, spread half of the cubed bread over the bottom. Sprinkle half of the rum raisins evenly over the top. Repeat with remaining bread and raisins. Pour the pumpkin custard mixture (and remaining rum from the raisins) evenly over the brioche. Allow it to sit until the brioche has completely absorbed the custard, about 30 minutes or up to 24 hours in the refrigerator. Bake the bread pudding, uncovered, for 40 to 50 minutes, or until it is puffed and set. If the bread browns quickly, cover the pan with tinfoil to prevent further browning while it finishes baking. Let cool slightly and drizzle with caramel sauce. Serve warm. To prepare ahead of time, cover and refrigerate the baked bread pudding overnight. Then, cover with aluminum foil and rewarm in a 325 degrees F (160 degrees C) oven for 15 to 20 minutes before serving. A new year has dawned, carrying with it optimistic aspirations and a hopeful outlook. For the first time in a long time, I feel like I can breathe. The future carries a rosy tint; the months ahead no longer feel so heavy and intimidating. As a third year teacher, I am finally in a place where I no longer need to spend each evening lesson planning and writing exams. After the past several years of spending what feels like all my time and energy trying to stay afloat, this change feels as if an enormous burden has been lifted off my shoulders. My time is finally, finally becoming my own. Heading into this year, I intend to work on a work-life balance. After so many years of the scale tipping heavily in the work direction, I allowed life to take precedence the past few months. I was greedy with my personal time, devouring books and television shows by the series, relishing being unplugged in the evenings. The freedom was seductive. I faded from here during those months, certain you'd be able to forgive the brief absences once I could reason them. The work-life balance will need continual adjustments, but with one heavy weight removed, it feels possible for the scale to even out. Among wishes of a dedicated exercise routine and not leaving dishes in the sink to "soak," eating more greens often nears the top of my resolution list. With the color spot on, I believe that this matcha pudding also qualifies as a green. After delighting in the pairing of green tea and coconut in this iced latte, it was time to bring the flavors together again in another form. The pudding itself uses only a bowl and whisk, making it nearly effortless to bring together. Go ahead, eat more "greens." Coconut Matcha Chia Pudding is simple to make and visually striking. 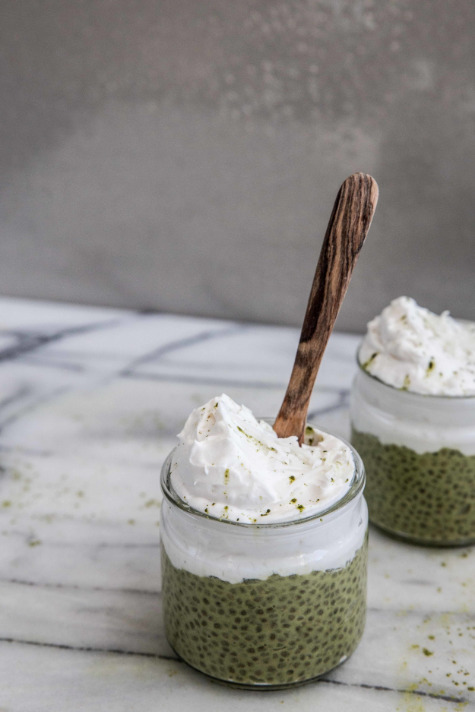 The matcha pudding is thickened with chia seeds and topped with a coconut whipped cream mixed with shredded coconut. The sweet, creamy nature of the coconut contrasts well against the earthy flavor of the green tea. The pudding and whipped cream balance each other beautifully—one should not be served without the other. Matcha is powdered green tea and can be found at most tea shops and health food stores. In a food processor or blender, blend together the canned coconut milk, matcha powder, vanilla, and maple syrup. Transfer to a medium bowl and whisk in chia seeds. Cover and refrigerate for one hour. Then whisk the pudding once and return it to the refrigerator to set overnight. Before serving, stir shredded coconut into coconut whipped cream. Set aside. Divide pudding evenly between serving containers. Top with a generous amount of whipped cream and serve.